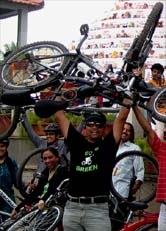 05june09-GoGreen-Ride - GGI-Group size: 4000+ Professionals, Increasing on day to day basis, Come & join us 2 serve Mother Nature. 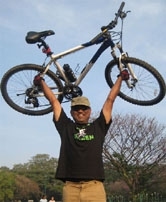 This Sunday our Go Green Campaign ride was towards ISRO Layout’s Lake. We decided to meet between 6:30-6:45am. TV9 Media was also present to cover our Campaign ride. Prabhakar Rao,Pranalini, Nalina Rao,Vijay, Pavithra, Vinod, Sunil, Rajaram, Sumith, Vipul, Vishwanath, Vinesh, Suhash, Sweanthak, Anup, Goutham, Prashanth, 3 new members.. We were totaly 20 members..
who is one of our active Go Green member is moving his base to Calcutta and this was his last ride and has give a word to make a Go Green base in Calcutta. Dear Sunil, we miss u a lot but on the other side we r glad to know our GGI Group is going to spread across Calcutta!! hopping to have more members from this place too !!
" We from GGI team, wish him and his family best of luck "
Enclosed below r snap shot from the ride.. People who have missed out this time pls make it for the next time. 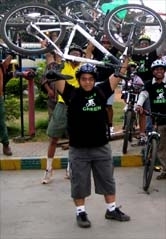 Video Clipping of 05jul09 Go Green Campaign ride and TV9 Local news channel's relay..